The surviving victim of the racist attack which killed Stephen Lawrence has been paid £100,000 damages by the Metropolitan Police. Duwayne Brooks' payment follows complaints about his treatment. Mr Brooks tried unsuccessfully to sue the police for negligence after the 1993 stabbing in Eltham, south-east London, which he witnessed. 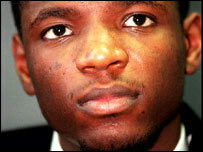 He claimed that he was treated as a criminal and went on to suffer from severe post-traumatic stress disorder. A statement from Scotland Yard said Mr Brooks had agreed to drop his legal action against the police as part of the settlement, which includes a written apology. The statement said: "This has been a protracted and difficult period for all persons involved and was initially borne out of the tragic racist murder of Stephen Lawrence and the attack on Duwayne Brooks." In a statement, Mr Brooks' solicitor, Jane Deighton, described the settlement and apology as a "sensible" step. "It should enable Duwayne Brooks to put the last 13 years behind him and get on with his life," she said. Mr Brooks was with Mr Lawrence and telephoned for an ambulance when his 18-year-old friend was knifed to death by a gang at a bus stop. Mr Brooks claimed police officers had dismissed his account of the attack and said he was treated as a suspect rather than a victim. He began legal action against the Metropolitan Police over his treatment in 1999. In 2002, the Court of Appeal ruled he could sue police for wrongful arrest and negligence and 13 officers for breaches of the Race Relations Act. But in 2005, the House of Lords said the claim for negligence should be struck out, leaving Mr Brooks free to pursue his other claims if he wished. No one has been convicted for the murder, described by Lord Bingham as the "most notorious racist killing which our country has ever known". 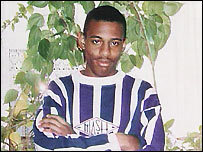 An inquiry into Mr Lawrence's murder concluded that the Metropolitan Police was "institutionally racist".